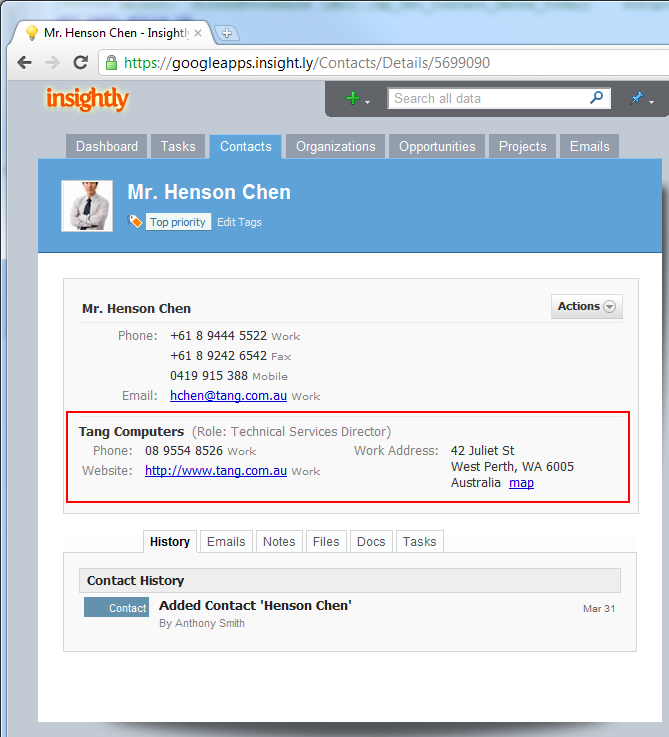 We made an improvement to Insightly recently to make it easier to upload files into your projects, opportunities, contacts and organizations. 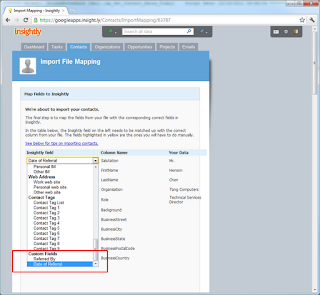 Previously in Insightly you could only upload one file at a time, but with modern browsers now supporting drag and drop file operations and multi-file uploads - we've re-engineered our upload system to make uploading easier. 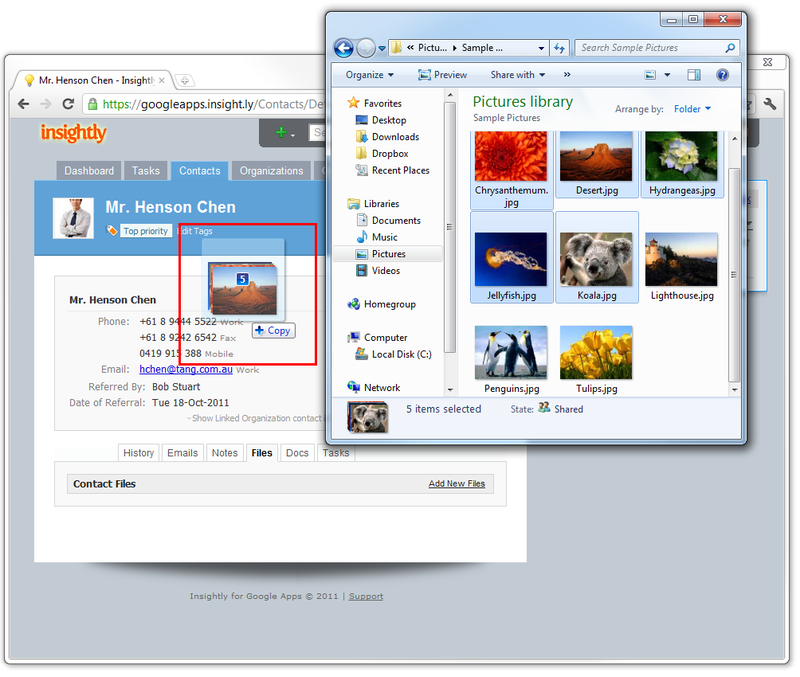 Drag and drop uploading works in Google Chrome, Firefox 4+, and Safari 5+. 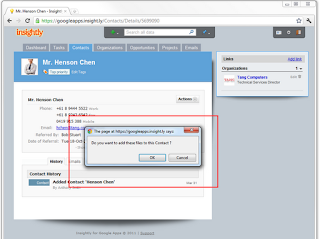 IE does not support this feature, but like the others browsers it does support multi-file uploads also described below. 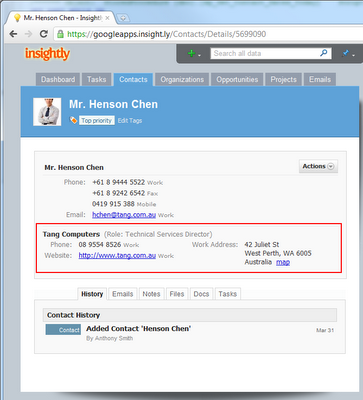 You can now drag files to your computer onto the page of individual contacts, organizations, opportunities or projects in Insightly, and you will be asked if you wish to upload these files. 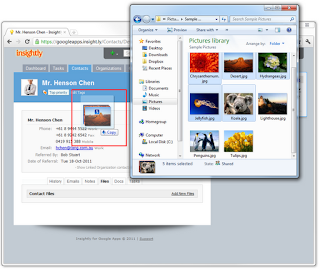 If you click the OK button, your browser will start uploading the files to Insightly and a small indicator will be shown until the files have finished uploading and are displayed under the files tab. 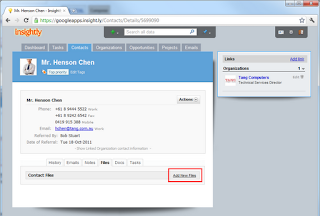 Drag files from your computer onto any contact, organization, opportunity or project. You will be asked if you wish to upload the files. 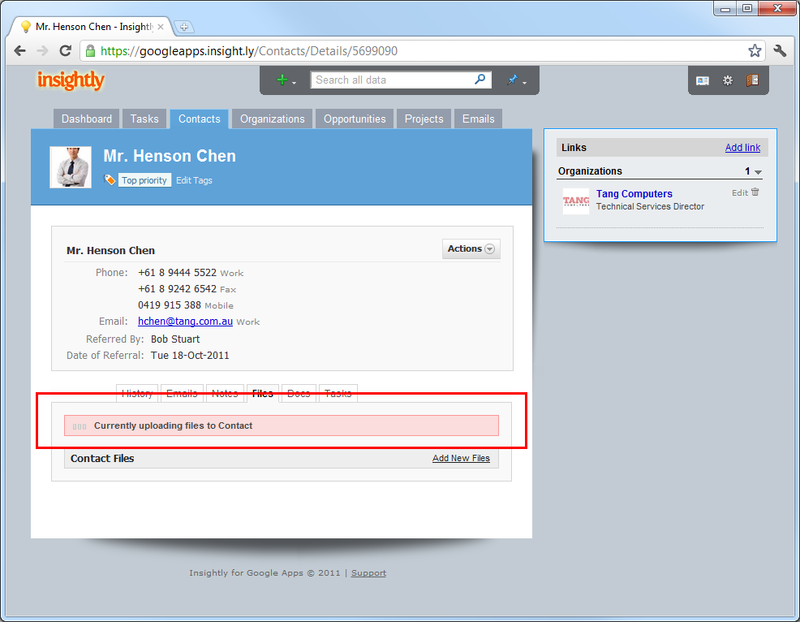 Your browser will upload the files to Insightly. 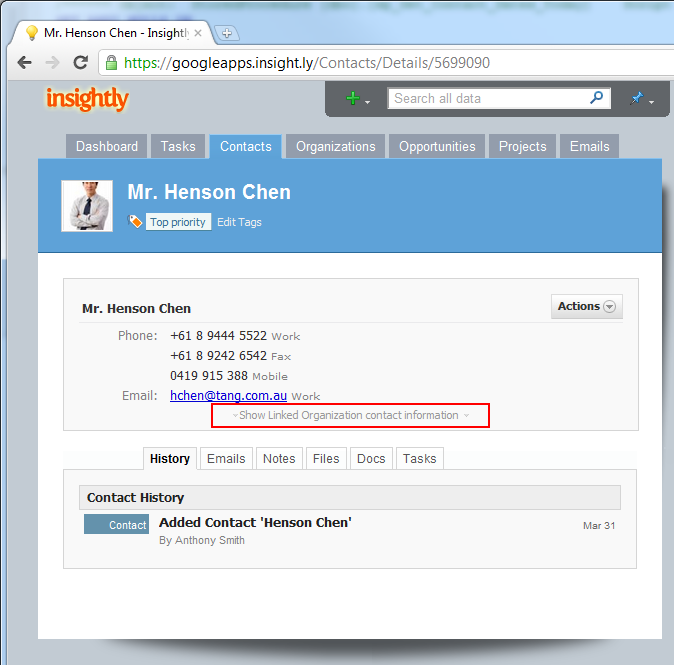 Your files will be automatically uploaded to Insightly. 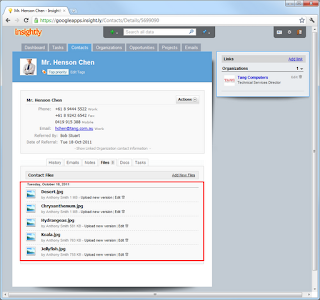 Insightly now also supports multi-file uploads, allowing you to select multiple files at once to upload all in one batch, rather than having to upload each file individually. To upload multiple files at once, just click on the 'Add New Files' link under the Files tab, and you can now select multiple files using your mouse of keyboard. 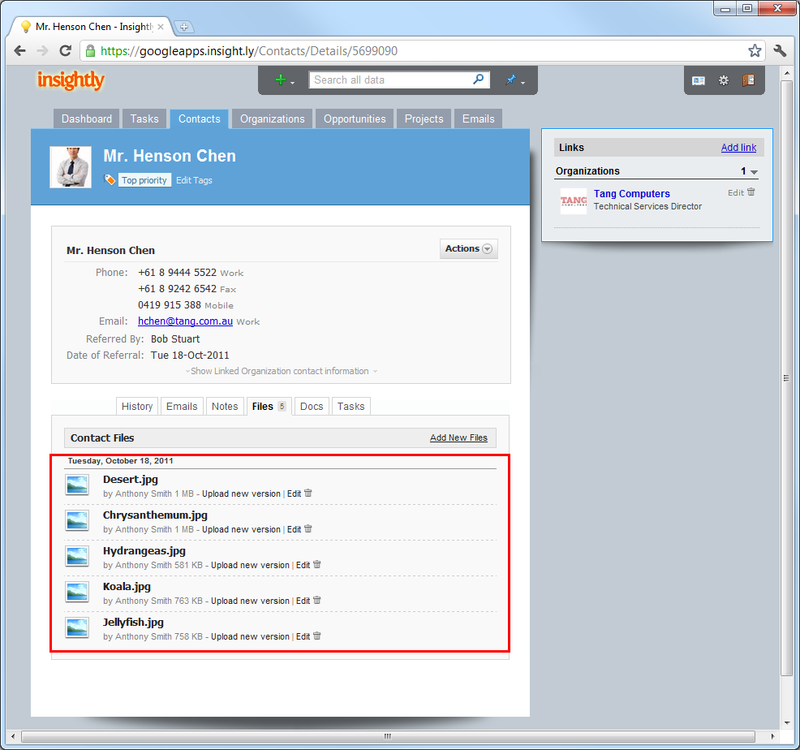 These files will then be uploaded to Insightly in one batch, saving you time. One of the big features we just launched in Insightly is custom fields. This is a great feature for capturing information that might be specific to your business that you want stored in Insightly and doesn't not quite fit in one of the existing fields. 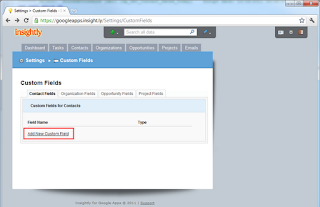 Examples of custom fields might include a tracking number or an reference order number from another system. 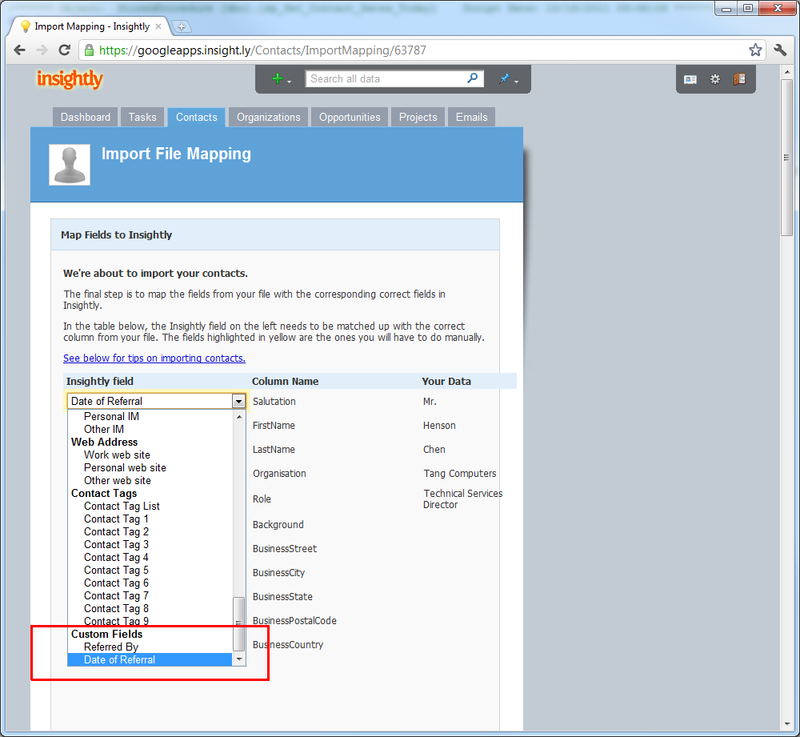 Apart from entering and saving data into custom fields, you can also filter by custom fields, and import and export data from those fields too. You can find the page for adding and configuring custom fields under the Settings menu, which is the small silver gear icon in the top right. 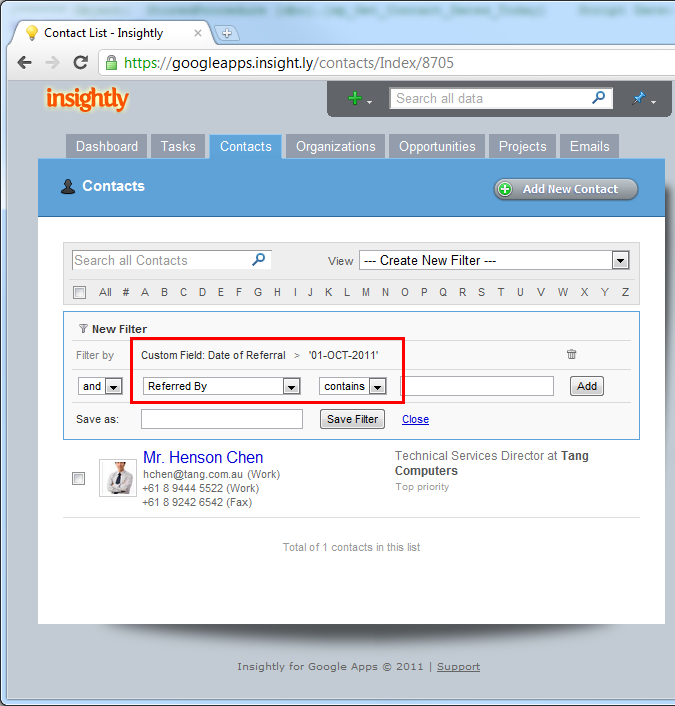 Insightly administrators can configure up to ten custom fields each for contacts, organizations, opportunities and projects. 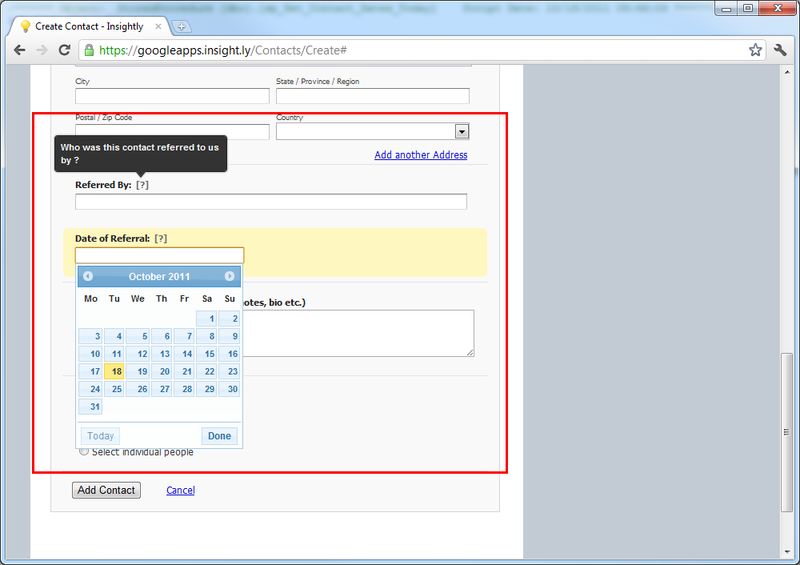 Field types can be either text, dates, or chosen from a list of possible options (in a dropdown). When on the tab the corresponds to the record type you want to add a field to, click the 'Add New Custom Field' link to add a new field. 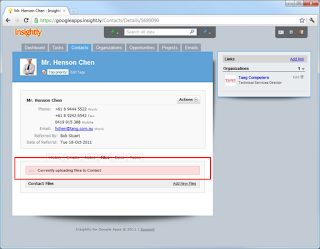 In this case we're going to add two new custom fields to every contact record in Insightly. 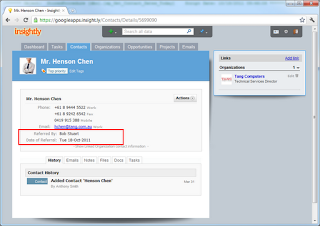 The two new custom fields we're going to add to contacts are a 'Referred By' field that tracks who referred the contact to us, and a 'Referral Date' field that records the date that the contact was referred to us. The 'Referred By' field is going to be a text field so we can type in the name of the person that referred the contact to us, and the 'Referral Date' field is going to be a date field. The other option available for the field type is a 'Drop Down' field, which is a good choice if you have a limited number of options to choose from and want the field data saved to be consistent between records (no misspellings of the same choice etc). 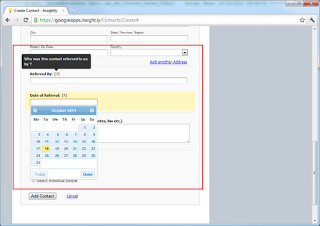 You can also add optional help text to explain to your users what this particular field is for or what data to enter. 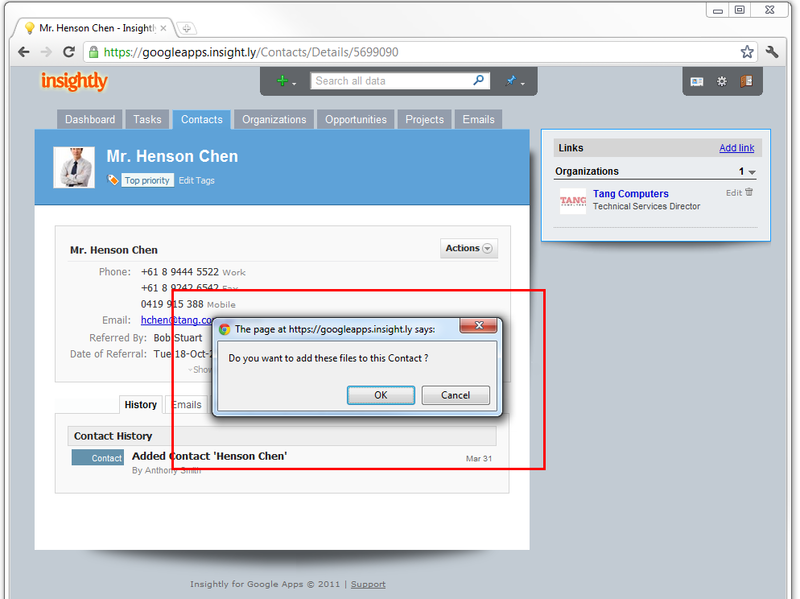 The text you enter in the help section is shown next to the field when displayed in the form. Now that we have our two custom fields for contacts setup - they will be shown on both the 'Add Contact' and 'Edit Contact' forms, and we can now save data into those fields for any contact. 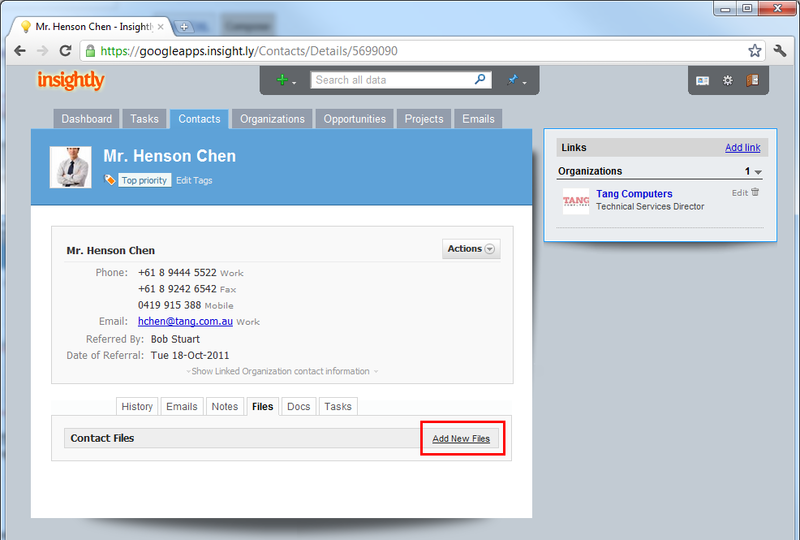 Data saved will be shown on the contact details page too. You can see our two new custom fields in the 'Add Contact' form screenshot below. The help text appears in a popup when you mouse over the '?' 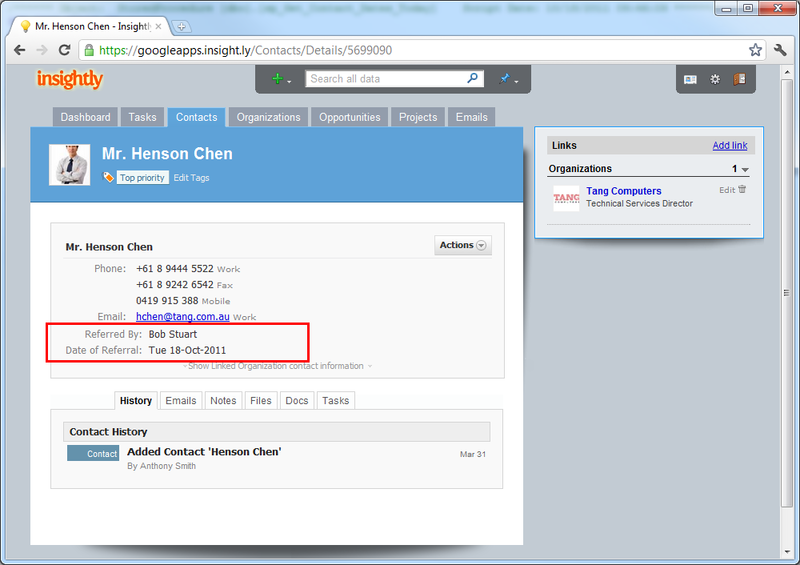 icon to the right of the field name, and if you have a date custom field a date picker will be shown. When you're viewing a contact that has data entered for our two new custom fields, the information is displayed on the contact details page as shown below. 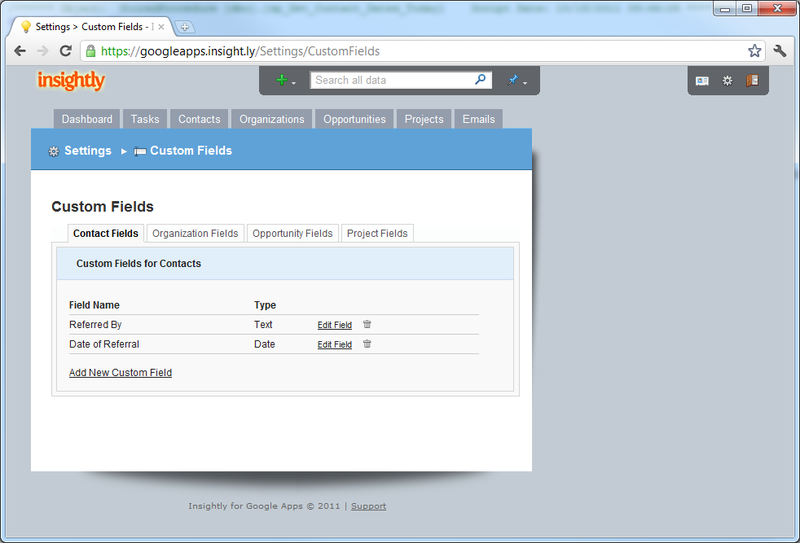 Custom Fields are also available in the field list for filtering. 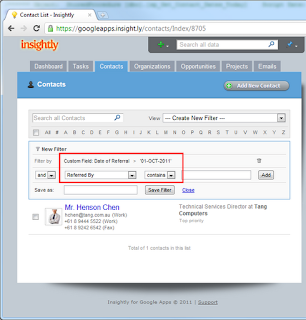 So we can filter our contacts list for contacts that have a date of referral (our custom field) after the 1st of October 2011. Custom Fields are also available in the field list to map to when importing from a CSV file, and they are output when exporting your records to a CSV file for contacts, organization, opportunities and projects. Custom Fields is one of those features that only a percentage of our customers need, but if you need them you really need them. They add flexibility to Insightly and make it a more customizable product that's adaptable to more businesses. We hope you like 'em ! One of the small improvements we've made to Insightly in the latest release is to provide a convenient way to see a linked organization's phone numbers, addresses, and other details from within the contact record they're linked to. 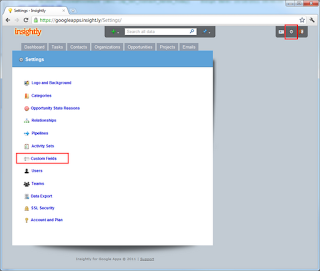 You could always see the organizations details by hovering over the organization in the links sidebar on the right of the page, but this is another way to see those same details that might be more convenient for some users. Hope you like it !